Research Is Better Than Hunches. But There’s Something Better Than Research. What could possible provide more insight than research? It’s what I call “Observable, Anonymous Behavior.” OAB is a type of digital data, and I’ll explain it using Mexican food. Jonah Lehrer’s famous book How We Decide has a simple premise: we make decisions emotionally, not logically. We make an emotional decision based on all kinds of psychological factors we can’t even articulate, and then we find logical reasons to support it. Thoughts start in the part of our brain that processes emotion. As I like to put it: we don’t get emotional about our logical decisions, we get logical about our emotional decisions. As business leaders and marketers, when we do our work – build campaigns, grow brands, promote products, brainstorm creative, produce content – we think about what inputs go into making great strategic decisions about our target audience. We can make increasingly wise decisions using a model I call HPCROAB. Just kidding, that’s absurd. Sounds like something they’d serve at Qdoba. At the bottom of the pyramid, we have hunches, or intuitions based on our experiences. In the middle, we have primary consumer research, which consists of quantitative and qualitative data. And at the top of the pyramid, we have observable anonymous behavior — real world, digital behavior that is observed and recorded, like email opens, page visits or whether someone bought their new Broncos jersey on mobile or desktop. Most organizations make business decisions based on hunches – without any external input from customers. We sit in a board room and go on our own experiences. One client calls it: “the pooling of ignorance.” No bueno. We rely on the experience of the agency and executives to make effective decisions, which is a crucial component of the model, but should not be the sole contributor. It forms the base for a reason. 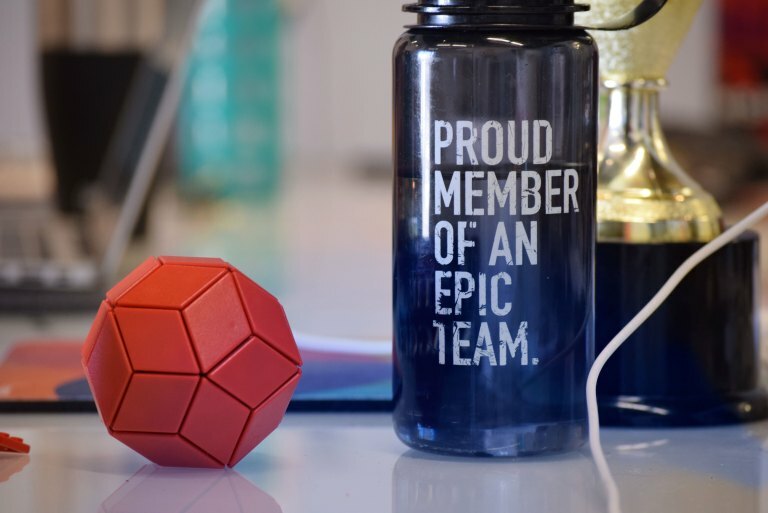 We’re nowhere without our Magneti wits and the wits of our client. Our hunches are wildly important. Primary consumer research is the voice of the customer. In this phase, we talk to various stakeholders and understand them in a deeper way. Research is worth the investment to bring an important voice into organizational decision making that was not represented before. I like to think of this process as purely anthropological: the more we can be empathetic marketers, the more we can understand what makes our audience different from us and what drives their behavior. We have never done a research project and been skunked. We have a deep, meaning “Ah ha!” moment every single time. Usually lots of those moments every time. But, primary consumer research can only go so far because, often times, people behave differently than they say they do or will. In fact, humans are notoriously poor at accurately describing what factors drive their decisions and behavior. Simple example: if you asked 100 people if they cared about the Kardashians, maybe 10 percent of them would say yes. (I need to try this.) But really, about 50 percent of the sample follow the Kardashians on Instagram (Kim has 120m followers) or click on articles about them. What a curious gap between stated vs. actual behaviors! People may say one thing to align with social norms or to avoid judgement, when really, they do another. 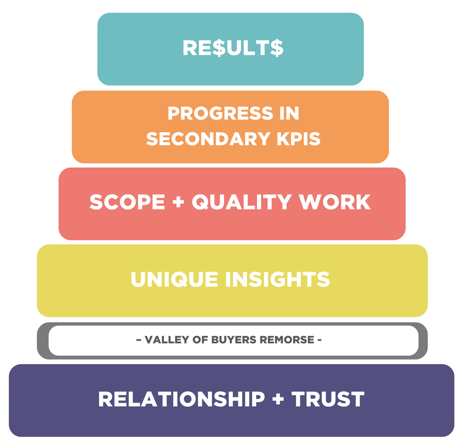 The top of the pyramid is where digital observation measures real behavior. Research unravels new hypotheses and perspectives, and OAB allows us to test those new assumptions. Without the top of the pyramid, you cannot optimize and fine tune. Digital metrics make OAB possible, plain and simple. OAB removes the need for the audience to be able to clearly articulate their own decision-making factors. Since they’d probably be bad at it anyway! Here is a Mexican food example, since I love Mexican food. 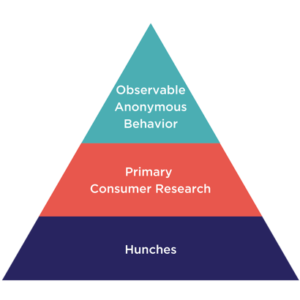 The three layers – hunches, consumer research and observable anonymous behavior – should be strung together when making decisions. 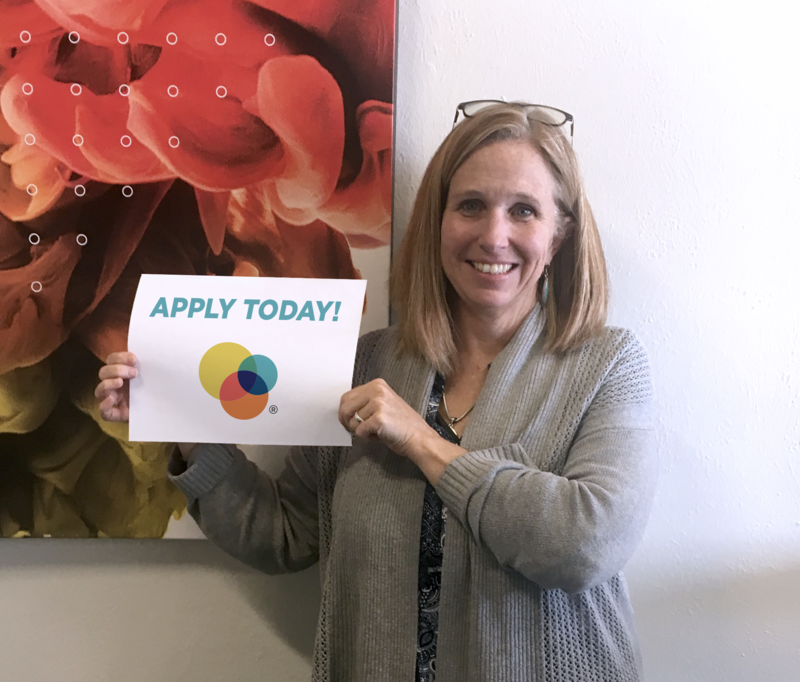 At Magneti, we offer consumer research and digital services – we create hypotheses with research to test in a real-world digital environment with analytics. The experience that we bring to the table is valuable and drives us at a deep level – hunches are a base on which we can build. Then we hear from the audience and measure those ideas using digital metrics. When All Three Layers Work Together, What Is the Output? When the decision-making pyramid is working well, it becomes a flywheel – a flowing series of increasingly helpful inputs. The best marketers are intuitively doing this: starting with an idea, asking people, then testing it in the real world. Those findings then inform the next set of ideas. The output when this flywheel is spinning: strategic marketing and communications that are empathetically responding to the felt and unfelt needs of the audience, validating and tweaked in real time over time. What Happens When a Phase Is Missing? 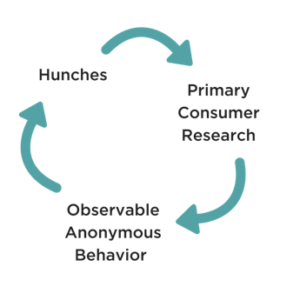 Without hunches, research and digital measurement don’t exist. You have to start from somewhere – your organization needs to have a vision or business objective before you can test it. Without primary consumer research, you’re limited to testing a hypothesis via digital that only you can think up. Primary consumer research gives us a whole new lense to try. Without digital metrics to provide OAB, we don’t actually know if anything is working. This is a core issue of digital vs. traditional marketing: what outputs (sales, leads, etc.) were driven by our inputs if we can’t directly attribute them? What Does This Mean for Me and My Marketing? How are we having better hunches about our work and our audience? How are we actively listening and learning from our audience in an empathetic and anthropological way? How am I biased by the Marketer’s Dilemma? How can we be measuring and tracking our work to drive future success?